Nila & Everett arrived at noon on Friday, August 24th, and we spent a quiet afternoon aboard "Life's2Short" before going into downtown Clarksville to eat dinner at the Blackhorse Pub & Brewery, a local establishment that came highly recommended by everyone we talked to. We all shared one of their specialty pizzas, which was very good, and sampled a few different brews before walking down the street to a nice piano bar for a nightcap. "Life's2Short" at the city dock in Clarksville, TN. Earlier that afternoon a couple we met briefly as we were leaving Prizer Point last week arrived at the Clarksville city dock and we spent a little more time chatting and becoming acquainted with them. Robin & Warren Kelly have been living aboard their boat "Pepi" a couple of months now and plan to continue this lifestyle for the next year or so before returning to New York. "Pepi" is a European canal-style boat which, unfortunately for them, does not have air conditioning but they seemed to be handling the heat very well. Robin is documenting their adventures online if you want to Google "Pepi's Ports of Call" and see what they've been up to. On Saturday we took the Hayes' car and headed to Nashville. Our first stop was at the Opryland Hotel, an incredibly huge and beautifully extravagant facility that everyone should see at least once. While there we stopped at an atrium bar to have a drink and had a great time meeting and chatting with Greg, the bartender. He was interested to hear about our lifestyle and told us about his former life in a band that played regularly at Windows of the World on the 107th floor of the World Trade Center prior to 9-11. He has had an amazing life thus far and we hope to see him again in early 2008 in the Clearwater, FL area where he plans to be visiting sometime in January or February. Can you figure out which one is Greg? What a great guy! Just a small sample of one of the exquisitely beautiful garden areas at the Opryland Hotel. After leaving the hotel, we drove into downtown Nashville and began exploring the area. Our first stop was for a late lunch at BB King's and then we progressed to several other establishments in about a two-block area throughout the course of the day. We also walked up a few streets to the Ryman Auditorium, the original sight of the Grand Ole Opry; through Printer's Alley, which was closed until later in the evening; and down to the riverfront to check out the city dock. The dock was nice and offered much needed shade from the late afternoon heat. We're still not sure why the city dock was closed for the weekend but someone told us they were having some kind of boat races there earlier in the day. Everett studies the menu at BB King's using Todd's broken reading glasses! Part of the Nashville skyline. The interesting building on the left is the Bell South building. By late afternoon we had wandered into a place that offered free pool until 7:00 p.m. so we proceeded to pair up (Todd & Nila and me & Everett) and play three games, all of which Todd & Nila won, even though we essentially gave them two of the three games by scratching on the "8" ball. But, them's the rules of the game, so to speak, so I guess we'll have to concede all three games - sorry Everett! An easy shot for my partner, Everett. The happy couple poses for the Captain. Does Nila seems especially happy after winning three games in a row??? We then found ourselves in a karaoke bar called Buck Wild and spent the next couple of hours being entertained by several different singers (some very good and some not so good) and some skimpily-clad dancing waitresses. Makes me wish I was 20-something again! Makes me really wish I was 20-something again!!! We were actually killing time at Buck Wild until Bud (Iceman) and Mary arrived so that we could all have dinner together. Bud had called when we were at BB King's having lunch and said that he and Mary had impulsively decided to drive to Nashville to spend the night. They finally arrived about 9:00 p.m. and we walked up the street to Demo's where we had a nice dinner before saying our good-byes and heading back to the car, destination Clarksville. It was a fun, full day and we were all ready to hit the sack when we arrived at the boat around 12:30 a.m.
No one had much motivation or energy on Sunday but we did manage to walk up the hill to eat a late breakfast at Kelly's Big Burger. After that we had even less motivation and spent most of the afternoon napping and reading and just relaxing in general. Todd and I took Nila's car late Sunday afternoon and made a run to Wal-Mart for a few necessities before returning to the boat to fix dinner. I made Pip's famous Vidalia onion dip and then baked some sweet potatoes and made salad while Todd grilled the filet mignon that Nila & Everett had brought from Harter House, a local grocery store in Springfield with a wonderful meat counter. We then retired to the bow of the boat where we enjoyed the beautiful evening sky with a nearly full moon. This tow pulled in to the shore right behind the boat to pick up some ice and Pepsi from someone on shore. We had breakfast on the boat mid-morning on Monday and then Nila & Everett gathered their things together and headed out about 11:00 a.m. for the journey back to Springfield. We tried to talk them in to staying another day or two but to no avail. It was a quick few days and we look forward to having them on the boat again soon, hopefully for a longer period of time next time. The rest of our day was spent enjoying what will probably be our last day plugged in to AC for a while. We will head back down the Cumberland tomorrow and should be on Kentucky Lake, anchored at Smith Bay, within a couple of days. We plan to spend one night at Paris Landing on our way back to Pickwick to see Todd's cousin Pam who lives in nearby Paris, TN; and we may also try to touch base with Kevin at Cuba Landing, although we will anchor near the marina rather than stay at the marina if we stop by there. We heard from Chuck & Pip yesterday and they were planning to leave Cuba Landing today, headed for Bay Springs marina where they will spend the next couple of months, so we will see them in mid to late September after we leave Pickwick and begin making our way south. I'm not sure when we will have Internet access again so please don't give up hope if it takes us a while to post another update. I suspect our earliest opportunity will be at Bay Springs in mid September. We arrived at Aqua Yacht late afternoon on Wednesday, August 8th, and began unpacking from our trip home. Kelly dropped by on his way home from the waterfall and wanted us to go for a ride with him, so we got in his boat and went for a quick jaunt to the waterfall and back. The outside of the boat was a mess (spiders and spider-doo) after sitting at the marina for two weeks, so the Captain spent part of Thursday morning washing it off. He then drove the rental car to Corinth to return it and rode back to Aqua Yacht with Terri, who lives in Corinth. We untied from the dock and headed out to the waterfall late Thursday afternoon, hoping that our "spot" was unoccupied, but it wasn't so we went down to the next cove and nosed into the bank for a while to get out of the sun. When we went back to try again, our spot was still occupied so we pulled in to a different spot to wait. While we were waiting, we saw Charles and Patrick Brumley, friends of Bud's, who we had met previously at the waterfall, accompanied by Kelly Edge whose family owns Sportsman's One Stop, a local convenience store and boat storage facility that serves Pickwick. From left to right are Kelly, Charles and Patrick. What a handsome three-some! The pontoon occupying our spot finally left and we were able to get settled in for the evening. After dark we heard several four-wheelers coming through the woods toward the gravel bar in front of the boat. This happens quite often when we're at the waterfall and almost always after dark. Not long after they arrived, we saw the headlights of a couple more four-wheelers at the top of the waterfall and then we heard something falling from the top of the waterfall. At first we thought one of the four-wheelers got too close to the edge and slipped over, but the guys on the gravel bar were cheering them on so we assumed that was not the case. They all left a little while later and we turned in for the night, wondering what had come crashing down the falls. The next morning the Captain saw something floating in the water on one side of the cove and discovered it was an old plastic toy motorcycle of some sort and that's what the kids had pushed over the falls. Bo & Terri arrived Friday afternoon, along with Tena & Keith and Ed & Wendy. Keith and Todd swam over to the side of the cove to retrieve the dumped motorcycle from the water and bring it up to the gravel bar. We had a fun evening and enjoyed sharing in the food that everyone brought. We spent a lot of time floating in the water on Saturday and Sunday to avoid the 100+ degree heat and having a good time with our Pickwick friends. Kelly & Melissa also came out Sunday, as did Bud & Mary on the pontoon, and our friend Mo brought her boat, "MOTU," into the cove later that afternoon after some of the crowd had thinned out. It's always a good time on Pickwick and our friends there have been very good to us, always bringing food to share and the ever-essential ice for our cooler! After dark several of the four-wheelers came back to the gravel bar and Todd told them they should do something about the motorcycle they had thrown off the waterfall a few nights ago - so they did. They burned it right there on the gravel bar in front of us! In the meantime, one of the kids got his four-wheeler too close to where the gravel bar drops off into pretty deep water and just about lost it. They were able to pull it from the water using another four-wheeler, but it was essentially submerged and they spent a long time trying to get it running again. We were also visited that evening by a pontoon boat full of people, after dark, and one of them had a loud speaker that he was using to broadcast jokes to anyone who would listen. The Captain then felt obligated to get on his hailer so they could banter back and forth. It was all quite amusing and entertaining! Kelly had taken Melissa home late Sunday afternoon but returned to watch the meteor shower with us that night. Todd took cushions to the gravel bar and Kelly brought out the sleeping bags and we all (me, Todd, Kelly, Bo & Terri) laid down to watch the shooting stars. Bo quickly went to sleep and Kelly and I were laughing too much and not paying attention, but Todd and Terri said it was a good show! We finally gave it up and went to our respective boats about 2:30 a.m. Kelly and Bo & Terri left Monday morning after breakfast, and we visited with Mo for a little while before leaving to go by Grand Harbor for ice and a pump-out where we saw Keith & Tena's daughter, Falicia, who works there part-time. We also saw Blake and Marlee of "Marlee Ann" who we met in Demopolis earlier this summer when they were making their way to Kentucky Lake. They walked over to the fuel dock and we chatted for a bit before heading toward Bud's house where we planned to anchor and have dinner. After half a dozen failed attempts to anchor in the grass and rock on the lake bottom, Bud called one of his neighbors and asked if we could tie up to the side of his dock. It was another brutally hot day and we were totally exhausted by the time we finally got the boat secured. Bud insisted that we stay overnight in his wonderfully well air conditioned, palatial home and we gratefully accepted. Mary arrived shortly after we got to the house, and she and Bud continued meal preparations while we chilled out - literally! Not long before dinner was to be served, Bud received a call from Patrick (first photo above) who was cruising by Bud's house with Kelly (also in photo above) and another guy named Rob. Bud invited them to tie up to his dock and come in for a drink and they ended up having dinner with us. To quote Kelly: "It was quite the "colonary" experience! "Life's2Short" at Bud's neighbor's dock. Mary and Bud, slaving away in the kitchen. What a beautiful presentation! The gang enjoys a "colonary" experience. When we were at the waterfall over the weekend, Terri & Bo decided that she would take Bo's 310 Sundancer and join us on the trip to Cuba Landing where we planned to meet up with our good friends Chuck & Pip aboard "Miss Pip." Bo had to go back to work for four days and planned to join Terri at Cuba Landing on Friday evening. We were originally going to leave Bud's about 9:00 a.m. Tuesday but had to wait a couple of hours for a barge to go through the lock ahead of us, so Mary fixed us a wonderful breakfast while we were waiting and we finally got underway shortly before noon. We anchored at Swallow Bluff Island late that afternoon and enjoyed the water and shade after another very hot day on the water. Who are those two hot babes anyway? We pulled anchor about 9:00 a.m. Wednesday and I got in with Terri about 11:00 a.m. when we stopped to take a dip in the water. Chuck had called and told Todd that the marina store at Cuba Landing was closed so Terri and I stopped in at Mermaid Marina to stock up on ice and put some gas in Bo's boat. We finally caught up with Todd just outside the entrance to Cuba Landing and I rejoined him on "Life's2Short." 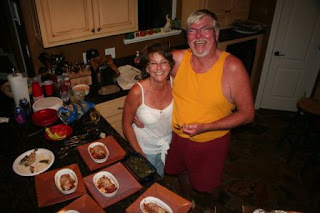 We got settled into a covered slip about 3:30 p.m. and spent the evening visiting with Chuck & Pip and enjoying wonderful stuffed mushrooms followed by grilled flank steak, bok choy salad and seasoned rice with homemade apple pie for dessert, courtesy of Chuck & Pip - what a treat! Since the marina wasn't open when we arrived, Terri tied to the end of the dock we were on but the marina had other ideas and made her move over to the transient dock Thursday morning, which was unfortunate since it was quite a distance from our dock and was very inconvenient, under the circumstances, since she was by herself. But, the manager wouldn't budge even though no one was using, or planning to use, the space at the end of our dock. Apparently, Cuba Landing is undergoing some changes in management and/or ownership and we were not at all pleased with their attitude toward transient boaters. I spent most of Thursday baking and cooking dinner (spinach artichoke dip, Parmesan pork zucchini boats with mushroom risotto and iced brownies) which we ate aboard "Miss Pip," and were joined by Kevin & Roxie and Austin. Kevin & Roxie live aboard their houseboat (an 87-footer, I think) at Cuba Landing, and Austin is a very talented artist who lives nearby and has painted graphics on several of the boats on the dock. It was another fun evening and Kevin offered to order ribs for the group Friday evening. Once we all decided what we were going to contribute, a trip to Wal-Mart was in order the next morning. Pip, Terri and I returned to the boats about 12:30 p.m. Friday and spent the next several hours putting groceries away and making our respective dishes for dinner. I made coleslaw, Pip made stuffed jalapenos and potato salad, and Terri made baked beans and bread. We ate on Kevin & Roxie's beautiful houseboat and then Terri and I walked over to the marina store about 8:00 p.m. to meet Bo who had caught a ride from Memphis with a co-worker. 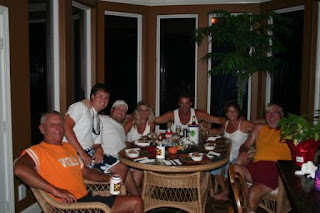 We all went back to Kevin & Roxie's boat and continued enjoying yet another fun evening. The Captain spent several hours Saturday morning giving the boat a good scrubbing. I did some more food preparation and baking in the kitchen but then took a break to join Chuck & Pip and Terri & Bo on "Miss Pip" for Bloody Mary's and Pip's tasty breakfast casserole. Todd even took a break from washing the boat to join us for a bit but then went back to work and to nap. I came back to the boat mid-afternoon and made a loaf of banana bread (my third in two days!) for Kevin who gave us a whole slab of ribs from Friday night's dinner to take with us. I also made a baked potato dish to serve with the steak we had planned for our Saturday evening meal. We all gathered aboard "Miss Pip" Saturday evening and Chuck turned his grill over to Todd to cook everyone's steaks. When Chuck & Pip surprised us at Bay Springs several weeks ago and treated us to filet mignon from the locally infamous Pickwick Grocery meat counter, we told them we would reciprocate when we came to see them at Cuba Landing. Terri brought a wonderful salad and Pip baked rolls provided by Roxie, in addition to my potato dish, more of Terri's wonderful baked beans from the previous evening and leftover apple pie, iced brownies and chess pie for dessert. Needless to say, no one went hungry! And, I might add, the Captain did a marvelous job grilling the steaks! The Cuba Landing gang, from left to right: Bo, Terri, me, Kevin, Pip, Chuck and Roxie. The Captain is not pictured since he is taking the photo. Kevin is cutting in on Chuck's harem. The Captain went fishing with a neighboring boat owner about 6:00 a.m. Sunday morning, so I got up when he left to get things in order to pull off the dock. Todd borrowed Chuck & Pip's car before we left to run over to the marina store to get some ice, and we finally said our good-byes and left about 11:00 a.m. Bo & Terri were also heading out, back toward Pickwick. We got about a mile or so down river and Todd discovered that he still had Chuck's car keys in his pocket, so we called and asked if they could meet us part way in their dinghy. They headed out and we met them just outside the entrance to Cuba Landing where we chatted for a few minutes and then continued on our way. The key exchange on the swim deck. Chuck & Pip wave good-bye as they head back to Cuba Landing. It was yet another hot day - sound familiar? - and we stopped in at Paris Landing marina about 5:30 p.m. to buy a couple of blocks of ice since the cubes just don't last very long in this kind of weather. We traveled a few more miles down river to our anchorage where we spent some time cooling off in the water. It was already windy by the time we woke up Monday morning and it continued to worsen throughout the day. The forecast was for 10-15 mph winds but it was more like 15-25 mph winds with gusts up to 35 mph which just made the heat more intense and unbearable! We tried to nose up to a gravel bar in Vickers Bay to have lunch but the wind pushed us off. We then tried to anchor in Sugar Bay but the anchor wouldn't grab the rocky bottom, so we finally anchored early afternoon in Smith Bay which has really nice sand beaches and decent wind protection from the southwest. According to the Fred Myers Tennessee River Guide, the photo below "...is an abandoned building used for shipping grain on the Tennessee before Kentucky Dam was built. The story goes that the building was built so well that attempts to destroy it failed. So, officials decided to leave it." We left Smith Bay about 9:30 a.m. Tuesday and experienced another hot and brutally windy day as we traveled through Barkley Canal into Barkley Lake. However, shortly after we left Smith Bay, we took a little detour into Pisgah Bay which is the site of an old stone quarry where many talented artists have painted graffiti on the surrounding rocks. The Captain even spotted a raccoon making his way along the rocks as we surveyed the artwork. Can you find the raccoon in this photo? This is the Kentucky State Penitentiary, known as "The Castle on the Cumberland," and is Kentucky's only maximum-security prison. 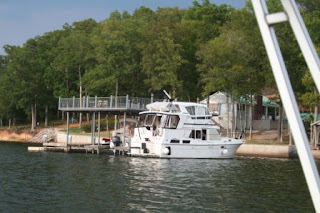 After less than five hours of battling the wind and heat, we pulled in to Prizer Point marina and plugged in to the AC. Todd's parents have kept their boat at Prizer Point for the past several years, and we even had a Lanning family reunion there last May, so Todd called his dad and asked if he needed to check on their boat while we were there. During the course of their conversation, Bill graciously insisted on paying our dockage for the evening, which we very much appreciated - thanks dad! We had planned to stop in and pump out our holding tanks anyway, and we were incredibly hot and miserable, so we decided to call it a day. We also needed to do some laundry, although I didn't have the energy or inclination to do it that afternoon. So I got up Wednesday morning and tackled the laundry first thing while Todd went to the shop to see if he could get what he needed to fix our single 50 amp to twin 30-amp splitter which appeared to be having a problem. As it turned out, it was the marina's 50 amp plug that was having the problem but we didn't find that out until Todd had spent $40+ dollars to put a new end on one side of our splitter! Since this really wasn't our fault, the Captain is trying to work a deal with the marina for a new 50 amp splitter, although I am not optimistic. At any rate, we finally forced ourselves to unplug from the dock about 1:00 Wednesday afternoon and continue the journey to Clarksville. We got to our anchorage at Dover Island about four hours later and found that it was too deep to anchor in the middle of the channel so we tried closer to shore, but the anchor just wouldn't grab good in the soft mud and we ended up pulling the bow into the muddy shore and tying off stern lines, which worked just fine. It was another very hot day but at least the wind was tolerable; unfortunately, the water temperature in this part of the lake was 94 degrees for some reason and was not refreshing at all, as you might imagine. The Captain thought this was an especially pretty view of the Cumberland. We left Dover Island shortly after 8:00 a.m. Thursday morning and traveled the final 35 miles to Clarksville where we tied to the city dock and spent the afternoon cooling down and catching up on the blog and e-mail. The Captain then took me out for a late dinner at Kelly's Big Burger, a local joint located across the highway just up the hill from the dock. I have to admit they do make a great hand-pressed burger and they serve breakfast anytime, so I'm thinking we'll have to visit them at least one more time while we're here! Nila & Everett are driving from Springfrield to spend the weekend with us and should arrive before noon on Friday after an overnight stay along the way. Our original plan was to go on to Nashville by boat, but the city dock is closed for the music festival so we will stay in Clarksville through the weekend and drive to Nashville for the festivities, probably on Saturday. The forecast is calling for 103 degrees today, which will make more than two weeks of near 100 or 100 degree-plus days, with a record high in that time period of 107 degrees! Can someone please do something about this heat??? After the weekend, we will make our way back to Pickwick Lake and spend a little more time there before continuing on to Bay Springs for a few days and then south once again on the Tenn-Tom to Demopolis, AL where we will likely stay through the end of November. We promise to keep you updated as time and Internet access allow! We arrived at Brenda's parents' house Friday afternoon, July 27th, spent the weekend, and then went to Springfield on Monday to see a few friends. We got together with several former co-workers and friends Monday evening at Big Whiskey's in downtown Springfield before heading to Nila & Everett's house to spend the night. I flew out to Colorado on Tuesday the 31st to see my parents and do some fly fishing with dad up in Wyoming. Arriving that afternoon at DIA, dad picked me up and we went to the parents home in Boulder for the evening. I always enjoy going back to my childhood home in Boulder, it brings back such fond memories of growing up and the wonderful times spent on Prado Drive. Though the mailing address is Boulder, I actually grew up south of town on South Boulder Creek near Eldorado Springs. Our home backs up to the Flatirons so my childhood playground was miles and miles of mountains and streams. Tuesday evening was spent enjoying Chinese food and catching up with the parents and what was going on in my old neighborhood. Wednesday morning dad and I loaded up the Jeep and headed north to Riverside, Wyoming, for some blue-ribbon trout fishing on the North Platte River. This has been an annual affair for me and dad for many, many years. A chance for both of us to enjoy each other's company in some of the most beautiful country North America has to offer. This is a partial view of the Sanger Ranch with the Snowy Mountain Range in the background. In this part of the world they cut their hay and stack it in cribs, they will then use hay during the winter months to feed the cattle. We fish on a huge (200,00 acre) ranch that dad has been going to for the past fifty years, I first started going up there when I was 6 years old... maybe younger?? We got on the water that evening and caught a few fish before the sunset, always a nice event on the Sanger Ranch. Thursday we were up and on the water by 10:00 a.m. and caught a number of nice trout before we got rained out late that afternoon. Overnight it continued to rain and the river got high and muddy so we were not able to fish any on Friday. A blue-ribbon Rainbow fall for the Captain's presentation! A little R&R on the banks of the North Platte River. Since there was more rain in the forecast we decided to head back to Boulder and spend the weekend with mom, other family members and friends. Returning to Boulder on Friday afternoon mom informed us that Mrs. V. would be joining us for dinner, Mrs. V. and her family spent many years with our family on the beaches in Sonora Mexico. Both Saturday & Sunday mornings were spent taking care of mom's "honey-do" list that she had compiled while we were in Wyoming. Saturday afternoon my niece from Montana, Kelly Larson, came to stay for the weekend. Kelly had never driven a stick-shift so Uncle Todd and Kelly spent a hair-raising hour working on the finer points of operating a clutch. Other than her uncle getting a few more gray hairs in his head, Kelly did pretty good for her first time out in the Jeep. Kelly and her Uncle Todd getting home from the practice drive......do I look stressed out? Saturday night for dinner we were also joined by another niece, Katie Constantine, and my good friend Rod Baptist and his girlfriend Donna. Knowing each other for almost forty years, Rod and I always have many stories to share and lies to tell! Sunday morning was spent finishing up the honey-do list and heading back to the airport. Saturday evening on Prado Dr. with my nieces Katie & Kelly and the P's. Rod Baptist & Donna Bradley..........looking good for almost turning 50 Rod! I arrived back in Springfield early afternoon to the waiting arms of my beautiful Admiral. We stopped for some Mexican food and margaritas at our favorite Springfield spot and then headed over to Bob & Linda Eckels for dinner and conversation. While we were at the Eckels we were joined by a neighborhood couple who is interested in becoming live-a-boards. We shared some of our adventures, both good and not-so-good, and encouraged them to move aboard as soon as their schedule allows. Monday was spent having the annual check-ups done with the doctors and dentists. It's much more "painful" doing these types of things when you don't have insurance coverage to help with the costs. Monday afternoon it was back to Brenda's folks house for a few days and then back to Pickwick Lake to return the rental car and resume our life aboard "Life's2Short." This brings us up to August 8th. We are working on another update that will cover the past few weeks and hope to have it posted soon. Thanks for your patience, faithful readers!